Azaleas are beautiful flowering shrubs. They fall under the deciduous and the evergreen subcategories of the rhododendron genus. Ever-blooming varieties can bloom for up to nine months a year. Most popular is the Encore variety, produced by avid azalea gardener Robert Lee, which blooms until frost. Problems with ever-blooming azaleas, however, can turn those beautiful blooms into deadheads without the proper treatment and care. If an older, established azalea in your garden suddenly dies, voles could be the culprit, according to the U.S. National Arboretum. Voles, or meadow mice, are common pests for ever-blooming azaleas. They feast on the roots and bark of the plant near its crown and sometimes all the way around the azalea trunk. This can kill the inner bark, and therefore, the entire plant. Voles attack the plant from below ground level and cause more damage if mulch is placed deeply around the trunk. Prevent this critter from damaging the azalea by keeping mulch less than two-inches deep around the trunk. This is a fungus that causes root death and damage to the bark tissue at the base of the trunk. Phytophthora rot is caused by one of many species of the fungus. The bark may look peeled back or scaly. The top of your azalea may also show symptoms of this problem. Early fall color and dead branches are all signs that this fungal infection is well advanced. Folded or thinning leaves and brown foliage are also indicators of the fungus. Poorly drained soil is a leading cause of the rot. Prevent this problem with your ever-blooming azaleas by planting azaleas in locations not susceptible to water runoff. 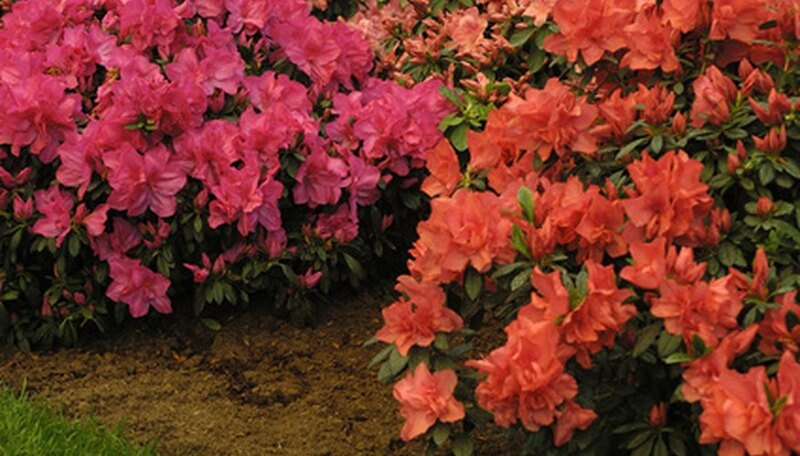 Planting azaleas in a soil/bark mixture provides for good drainage and fungicides like Terrazole and Truban can be used to protect your azalea from phytophthora. Always follow the manufacturer’s directions when applying a fungicide. Root weevils are one of the worst insect pests that trouble azaleas. This pest is found in nearly all parts of the world and attacks over 100 different species in addition to azaleas. Black Vine weevils are the most common of the species. This insect ranges in size from one-quarter to one-half inch and ranges in color from gray to black. If this bug is pestering your azalea, you will notice notches or spots that look like the edges of the leaves have been nibbled. Although this pest can make your azalea look damaged and unsightly, it is not usually hazardous to your plant’s health. Prevent root weevils by pruning off lower leaves to prevent access to the plant.